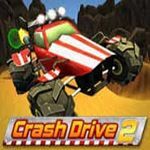 Was the first Crash Drive page deleted? Gagarsa06 wrote Was the first Crash Drive page deleted? There are more than 30 vehicles, but it takes a few hours to unlock them all.